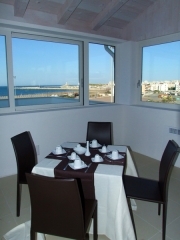 This new and exclusive hotel is positioned 50 meters from the seaside with a splendid panorama of Vieste and 500 metres to the town centre far which offers a range of things to see and make. "Passions, colors and traditions are elements that distinguish our region. A combination that involves heart and soul. " 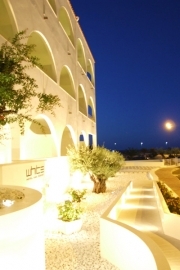 Full of quality services and comforts, White Hotel and Resort offers welcoming atmosphere with modern designed and furnished rooms and terraces including re-diffusion, clima with personal control setting, private sanitary services, tv, mini bar, telephone, direct fax and safe. What better way to start on your day with a rich morning buffet? Lights and water games suggest your holidays in the swimming-pool and Jacuzzi giving you a kind of relax. The main railway stations are Foggia and San Severo. Both are well connected to Vieste by bus and local trains. The nearest airports are: Palese (Bari), Pescara and Capodichino (Naples), all offer public transport services and car rentals and are located about 150/200 km away from our city. There are several bus connections from the main cities including Rome, Naples, Pescara, Bologna, Reggio Emilia, Turin, Venice, Modena, Parma, Padua and Milan. This service is guaranteed especially by Ferrovie del Gargano. From the A14 motorway (Bologna-Bari) take the exit of Poggio Imperiale and continue the highway to Vico del Gargano (end of highway), then go on to Vieste. Driving along the A16 motorway (Napoli-Bari) take the exit of Candela, then stretch of highway that connects the motorway exit in Foggia (about 20 minutes), then Highway A14, exit at Poggio Imperiale, then go on to Vieste.